You are viewing all posts published for the month of février, 2017. If you still can't find what you are looking for, try searching using the form at the right upper corner of the page. 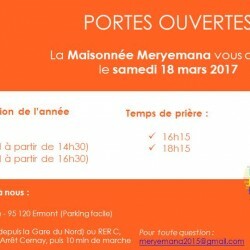 Encore 1 clic pour trouver l’intégrale de l’invitation aux Portes ouvertes 2017 de Meryemana en pdf!